This eBook is the perfect primer to jump start your online business. It contains resources from branding, business licensing, finding products, shopping carts, online jobs to customer service tips and much more! If you are ready to get started but have no idea where to start this little eBook is for you. Excerpt: Congratulations on taking your next step toward securing financial freedom, through use of readily available tools which are consolidated, presented and explained within the following pages. This book is designed to nurture and expand new ideas, as well as lay the groundwork for making goals a reality. Having an idea, whether it be a product, distribution of a product, or an idea for a book, is typically the first step. It's a step almost everyone has achieved at some point in their life, so why is everyone not establishing an online empire? The answer is simple: it's overwhelming. The more correct answer is overwhelming if you are not prepared. I know you're excited but please read the entire ebook before you start. It's better to see the big picture before jumping in feet first, since some things must be done in a particular order. • Can You Write an eBook? Reader bosingwa says, "This book is overwhelmingly good. 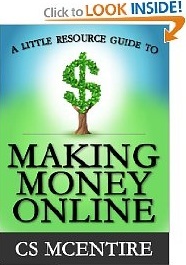 It shows multiple ways of making money online and offline. MCENTIRE knows a lot of stuff that can easily rake you instant cash if you follow his steps. at least you will find five or more businesses that you can start doing and make it." Reader Rebecca Johnson of Washington says, "Did you know you can make $5,000 a day on YouTube? Before reading this book I had no idea you could. This book also discusses what will attract customers and what will drive them away. This book is filled with great secrets you will want to know if you plan on selling anything online. The author has thought of everything from branding to taglines to how to get a business started." There is also information on affiliate programs, eBooks, online tutorials, blogging, working with search engines, advertising, press releases, writing articles and photography. To top it all off there is also information on how to avoid scams. I found this book very helpful and intend to read it again and again to keep the new ideas flowing." Click here for more information.